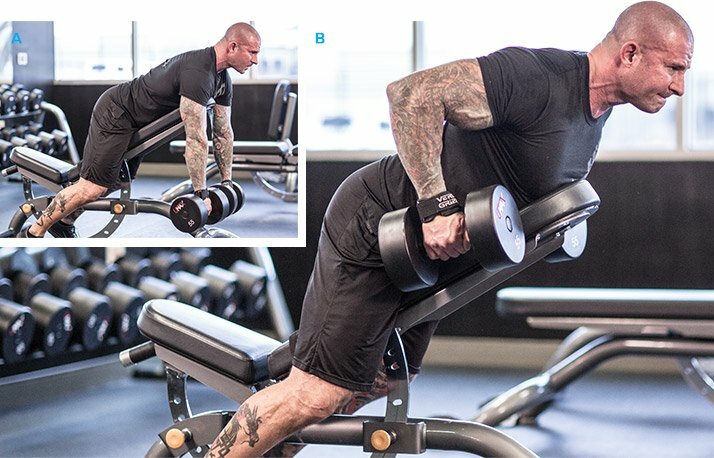 This pre-exhaust workout from Jim Stoppani's Back and Fourth program features 8 row and pull-down variations. It will push you to fatigue and force your lats to grow! Today's muscle-building back workout is part of my 6-week "Back and Fourth" program designed to maximize size and strength. In the title, "fourth" refers to the four types of exercises and four distinct rep ranges you'll use throughout today's back attack—and, indeed, for all the larger muscle groups trained in the full program. Over the course of eight total exercises in today's session, the first and last four mirror each other in terms of movements and reps—hence, "Back and Fourth." 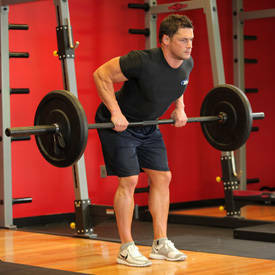 In this back workout, you start and finish with two slightly different variations of barbell rows for 8-10 reps. Between those bookends, you progressively climb up to 15-20 reps, then back down, hammering the muscles from different angles along the way. Before you get started, be sure to focus on establishing a strong mind-muscle connection to engage your back in every rep. It's easy to let your arms do all the work here, but if you focus, your back will dominate. Wrist straps, thumb placement, and elbow movement through the rows and pull-downs will all contribute to a focused and successful workout. Now check out the video and get ready to grow! 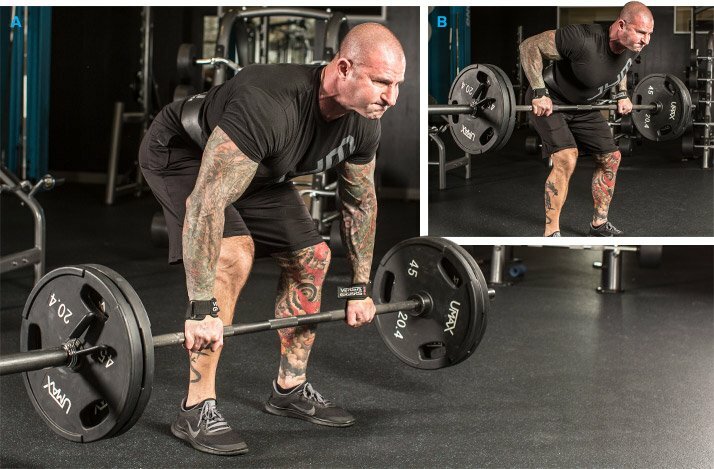 Jim Stoppani Back Varticle "Back And Fourth"
Rest 1-2 minutes between sets. The workout lasts about an hour. Shoot for a weight that allows you to meet failure in 10 reps. Stand with a shoulder- to hip-width stance. A wider grip on the bar—with both this row and the pull-downs to come—will put the focus more on your upper lats, because the elbows move out to the side. 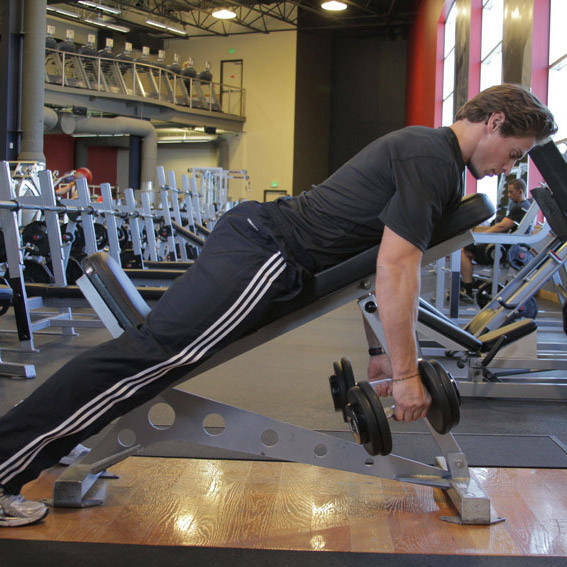 Pull from the floor and let the bar touch each time to relieve stress on the lower back. Let your legs help you explode the bar up from the floor. Keep your knees slightly bent, maintain an arch in your lower back, and bring the bar up to your midsection to get a nice contraction. I am a stickler on form. You often see people bring the dumbbell to their chest, but I prefer to bring it closer to the hip and allow the elbow to come up high, even holding it at the top for a second to contract the lats. I use wrist straps on pulling exercises. 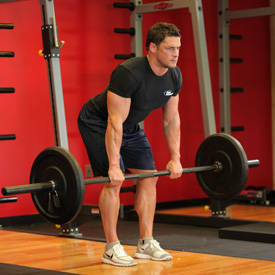 On the dumbbell row, I use an open grip, where the thumb isn't wrapped around the bar. Turn your hand into a hook to focus on the lats. If you have to squeeze the dumbbell, it engages the forearms and biceps instead of the back. Use a standard overhand grip. Pull to the chest, but not necessarily all the way. Focus on the lats versus pulling with your arms. Move slowly and repeat for reps. This is one of the only single-joint exercises you can use for the back (because it doesn't involve any bend around the elbow joint). This version is done with a rope. 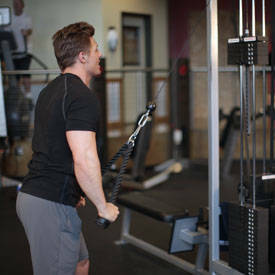 Each arm moves independently, and the rope allows you to pull the weight farther back because you can bypass the hips for a longer range of motion. This is where fatigue sets in. 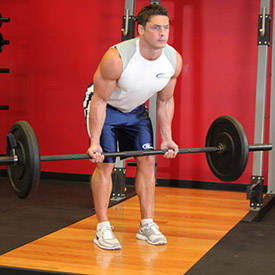 Using a wide grip on the straight bar, focus on using your lats to pull the bar down to your thighs. Squeeze your lats as the bar touches your thighs. Again, use wrist wraps here. Use a shoulder-width grip to find the most comfortable position. Bring the weight to your chest and squeeze the lats before you allow the bar to move back up. 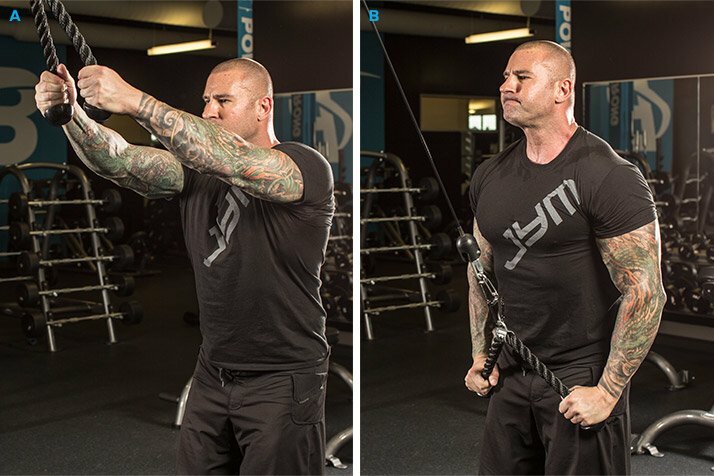 The overhand grip you used before targets the upper lats, while this reverse grip moves the elbows farther forward, putting more focus on the lower lats. 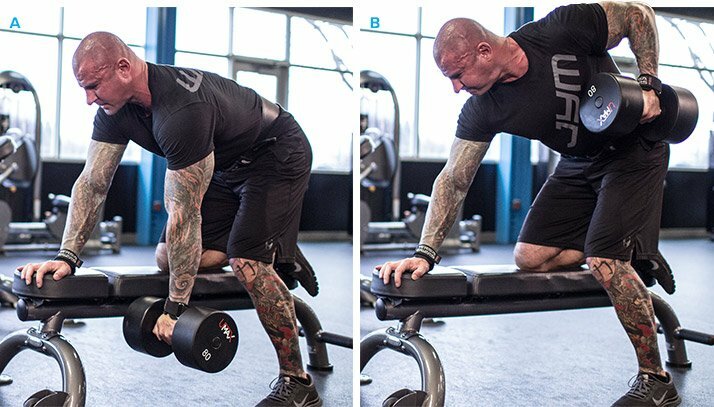 This two-arm version of the row allows you to further isolate the lats by eliminating any ability to cheat on the exercise. 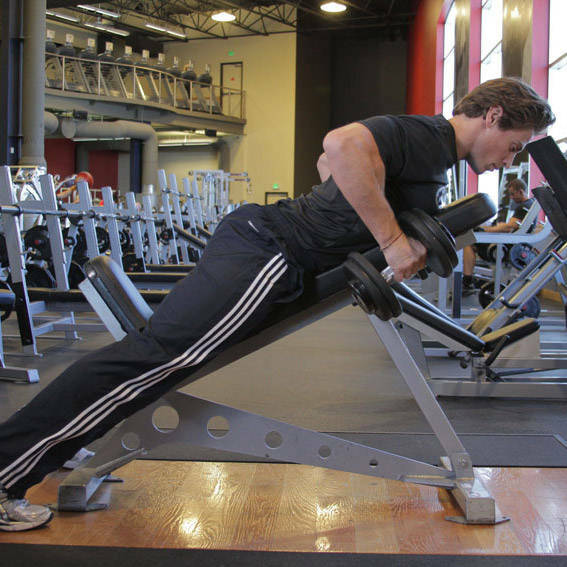 You lie face-down on a bench and rely on your lats and arms to pull the weight. You'll have to go a bit lighter than normal. Move slowly and focus on pulling with your lats! The reverse grip here brings your elbows closer in toward your sides as you bring the weight up. That helps you target the lower lats and end your session with complete and total back destruction, which leads to total development. Dr. Jim Stoppani is our supplement guru. His practices in the lab and workout regimens are backed by science.